In the fall, as birds prepare for the migration south to their winter territories, they eat more and favor richer foods so they can store energy for their long journeys. We can all help by offering nutritionally sound foods in our backyards. Backyard food, water sources and shelter will also encourage winged winter residents to stay nearby and keep your yard lively through the coldest months of the year. Rich Food: In the fall, many birds are going through their yearly molt and are growing a new plumage with a thicker down to offer them some protection against the cold. At that time they require rich foods, such as oil-rich sunflower and Niger seeds. Hang fresh suet, as birds are looking to gain some fat to help them through the cold season. Provide high-calorie foods, such as seeds, peanut butter, chopped nuts and whole weat bagels / bread. Feeders: In addition to the standard bird feeders, provide several few low-height feeding trays and fill them with cracked corn for doves and other ground feeding birds. 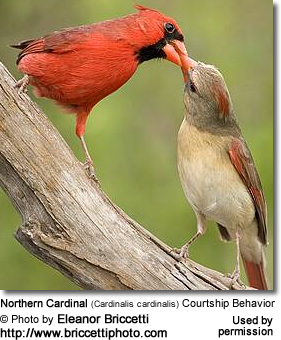 It is IMPORTANT to keep the feeders full since many birds will rely on it as a regular place to eat. Keep feeders clean by washing them thoroughly every one to two weeks, using hot water and mild soap (keep in mind that anti-bacterial soap is toxic to birds - so if you use that or anything else that could harm them, please rinse off very carefully). Don't forget the Hummingbirds! They may visit Hummingbird feeders up to times of hard frosts, so keep their feeders filled. Water! 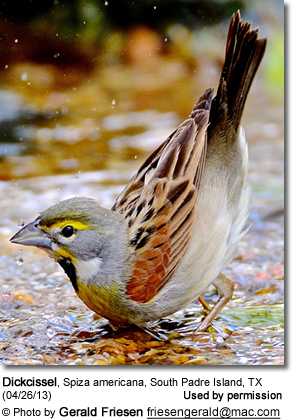 Make efforts to ensure fresh water for birds as you move into winter. Be sure to empty ice and refill whenever frozen. Heated bird baths are very helpful in areas where temperatures go below freezing. Provide Protective Cover: Provide cover and a source of seeds, by leaving dead flower heads and grass stalks standing. Collect fallen branches and add to a brush pile. 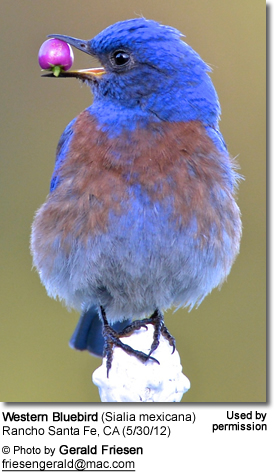 By mid-winter, repair old nesting boxes and/ or install new ones. Special Considerations During the Winter Months: Remove accumulating snow from evergreens, thus preventing breaking limbs, which cause damage to the tree, and are a potential disease threat. Use sand or non-toxic ice melting solutions, when dealing with icy conditions. Choose plants that are providing food and/or protection for wildlife. Plants that provide food for birds: Some people plant non-native species, such as pyracantha or cotoneaster for the birds, but native plants attract a greater diversity of songbirds and often greater numbers as well. The flowers, foliage, leaf litter, etc., of native species also attract insects which the birds will feed on.Plants that provide food to birds include: chaparral currant, California gooseberry, osoberry, California barberry, buckbrush, blue witch, twinberry, pink-flowering currant, brown dogwood, chaparral clematis, sticky monkeyflower, golden currant, California dogwood, California wild rose, California coffeeberry, toyon, western virgin's bower, California blackberry, thimbleberry, coyote brush, hollyleaf cherry, creambush. Large brushpiles, built on foundations of the largest logs and branches, will attract lots of insects that birds can feed on. Do make sure to arrange the piles / logs to create lots of hiding places. During the winter you will see lots of birds enjoy this excellent foraging opportunity. The bright red berries are the favorite food of robins, purple finches and other waxwings in winter. Toyon is very easy to grow. Provide enough room so that little or no pruning will be required. The fruits in early summer attract an extremely wide range of birds, such as quail, thrashers, grosbeaks, woodpeckers, orioles, house finches, and orange-crowned warblers. It is very easy to cultivate. It can be cut to the ground every year in its winter dormant season, and it will still grow up to flower and set fruit. This popular landscaping subject provides good bird food. They can be severely hedged, but it is best to allow them to grow at least 6 feet tall, or better yet, give them plenty of room to develop as specimens. For maximum value to birds allow them to be branched to the ground and allow leaf litter to accumulate. This riparian species grows very fast with some water. It features lush foliage, bright blue berries in late summer loved by many songbirds, and some fall color as well. Small birds like to nest in it. These are easy to grow and very decorative. 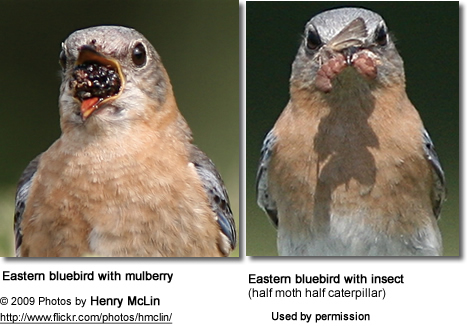 The fruits are attractive to birds that normally eat mast or insects, such as jays, woodpeckers, titmice, and wrentits. Poison oak is an important food for many birds, especially wrentits and hermit thrushes. Obviously, it is best not to plant them near trails and other frequented areas. Wash your hands before and after servicing bird feeders and baths. Birds will get sick from moldy birdseed or pass diseases on from your feeder to other birds. Shake your seed feeders before refilling to dislodge compacted seed. Dump out any wet clumps of old seed.Don't allow large amounts of seed to become wet on platform feeders. Instead, when it's wet outside, feed from covered feeders that will keep seed dry, or put out only a handful of seed at a time on platforms.Clean all hulls off platform feeders and out of seed trays daily.At least once a week, scrub feeders down with a bleach / water solution (1 part bleach to 10 parts water). Rinse and allow feeders to dry before refilling with seed. Too many birds together is unnatural, unsanitary, wasteful and dangerous to birds, some species more than others. Viewing only a few birds is more appealing than a bunch of noisy fighting birds. Cut them off occasionally. They will find feed elsewhere and come back when you feed again. It will make them less dependent, more resourceful, smarter, and healthier. The same nutritious ingredients necessary for life - carbs, fats, proteins, vitamins, minerals, and water - are the same ingredients that promote bacteria, mold, mildew, intestinal illness, disease and death. One who attracts flocks to unkempt, unsanitary feeders is not a friend of birds.